“I have worked a great deal with the CommandWear technology including industry testing and find it top notch. Blue Force tracking is the wave of the future and these guys are ahead of the curve.” Tactical Commander, Federal Police Force. Track your teams and communicate more efficiently. Go operational with minimal effort and cost. CommandWear is a cloud or enterprise based solution that works with customers’ existing equipment and networks for easy, fast, secure and affordable deployment. The HUB securely stores all messages and location information for later review and analysis. The Commander HTML5 web app provides a map-based view of all personnel, a messaging interface and access to Admin tools. The Communicator app runs on a smartphone (Android and iOS) and uses the phones GPS for tracking, camera for photo/video sharing and provides a secure two-way text messaging interface. 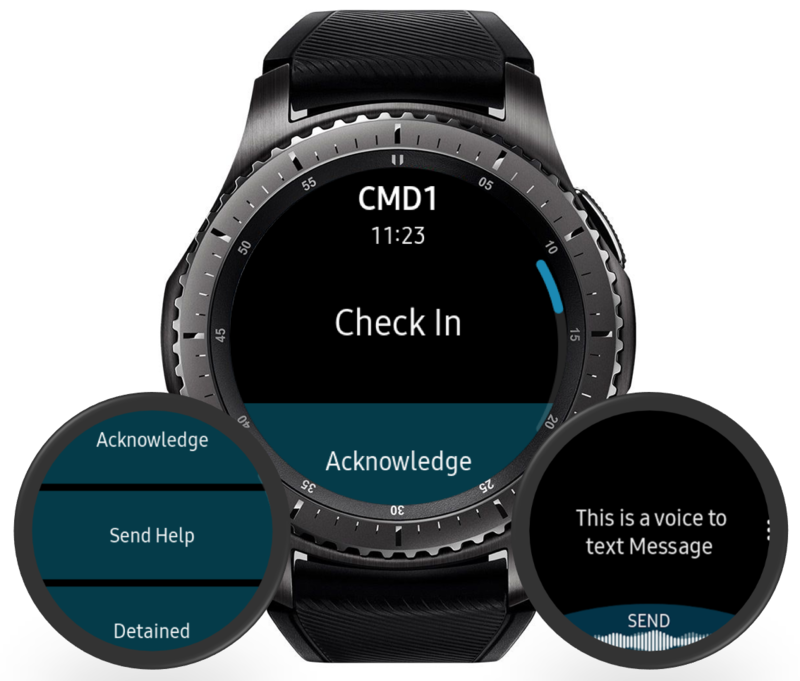 The Smartwatch App integrates through Bluetooth on the smartphone and provides messaging, heart rate monitoring and alerting functions (standalone Android Wear and Samsung Tizen compatible smartwatches can also be used for messaging, heart rate monitoring/alerting and GPS tracking). An Application Programming Interface (API) allows data to be fused from external devices/sensors and shared with fleet management, dispatch, operations center software or other systems. The web-based Commander app can be accessed securely from any existing tablet, desktop or laptop. A simple user interface allows for immediate deployment. Just download the smartphone app, login and start using it. Personnel status and message information is clearly visible in a pop-out menu. Emergency alerts clearly displayed with audible and visual cues. The situation map is updated in real-time with controls to adjust the update frequency and turn on/off tracking of devices, heart rate monitoring and video/audio feeds from each tracked resource. 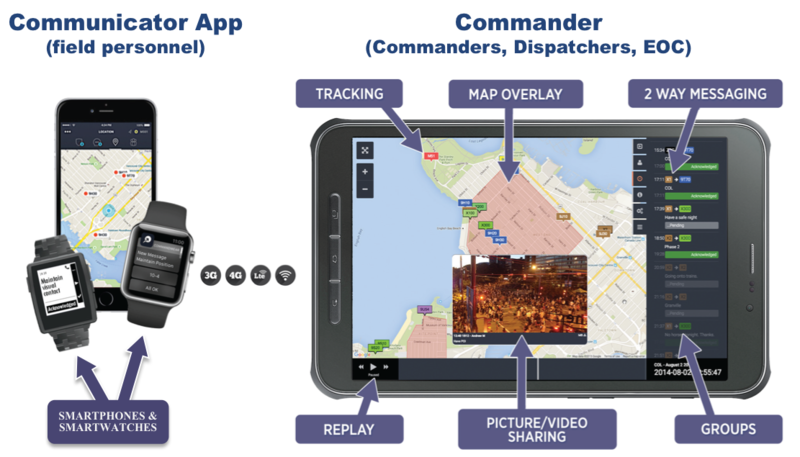 Pictures and Videos can be shared and streamed among Responders and Command, with notes, timestamp and geo-tag (instantly appears map). Groups can be set up to manage monitoring of different teams. Map overlays, such as routes or floor plans, can be added to the map and easily toggled on/off. Drawing tools allow annotations and plans to be instantly shared. With permissions, Admin Tools can be accessed to configure the system including adding new users on the fly, enable/disable GPS tracking and adjust frequency of updates, monitor each devices battery life and connectivity, etc. Messages (encrypted) can be sent to one or all team members with delivery confirmation and automatic message retry. Messages can be Acknowledged at the click of a button to assure they are read and understood. A chronological message history log is displayed. Preset messages/responses and voice-to-text controls eliminate need to type (also supported on smartwatches). Pictures and video are sent with notes to individuals, groups or all tracked personnel. Video/audio can be streamed from the smartphone or remotely turned on via the web app. 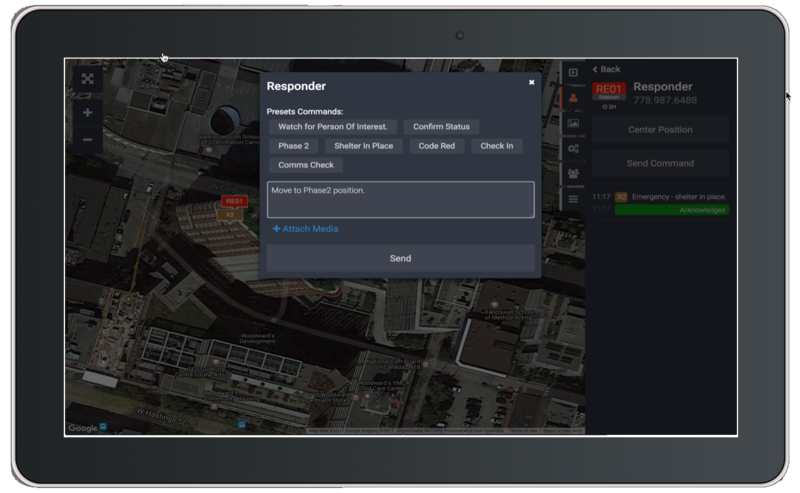 The Communicator App runs on a smartphone and provides field personnel with tracking, picture/video sharing, mapping and messaging capabilities. GPS tracking runs even when there is loss of network connectivity (and synchronizes logged GPS track data when re-connected). Messages are clearly displayed with a customizable vibrate/sound. Create and send geo-tagged pictures/video from the field with notes, including option to stream live video/audio. (acknowledgements can also be sent via a one-button push on the smartwatch). Preset Message Responses support simple and quick one-touch communication. Message history is available for review and report writing. Android and iOS apps available in the app stores. The Communicator App works with a smartwatch, allowing the phone to stay in the pocket. Vibration on the wrist allows instant awareness of incoming messages while keeping hands free. Quick, one touch response to messages. Alerts (Call for Assistance / Panic Button) provides monitoring center and/or Command with visual and audible alarm showing location of the alert on map (available Q3 2018). Heart Rate Monitoring and Alerting based on configurable threshold settings for each person. Optional safety feature to auto-trigger video/audio streaming from a designated smartphone when alert received. All features are available on watches running Android Wear 2.0 or Samsung Tizen operating systems. Basic message notifications and replies are available on other smart watches, such as Apple Watch. Samsung Gear S3 app supports untethered (standalone), LTE-connected operation. The CommandWear Server logs and stores all messages, locations, media and device status and sensor data in the database. Historical logs of any event or time period can be replayed graphically and reviewed for an accurate accounting of what happened, when, where and why (e.g. used for investigations and inquiries, planning, debriefs, training). Replay controls allow fast-forward, rewind, pause and scrubbing to quickly find what you are looking for. All of the messages are visible through a pop-out menu and highlighted as the timeline clock progresses. Selecting a message from the Replay log instantly takes you to the situation map showing everyone’s location and photo’s/videos on the map when that message was sent/received. All pictures and videos appear on the map based on date/time and location taken. Contact us to for an interactive web demo or no obligation test drive. Review a 5-minute demo by clicking on the image below and turning up your volume.